CINCINNATI (AP) — An Ohio zoo and a California group the zoo loaned a male silverback gorilla to in 1991 have agreed on a plan for the gorilla's court-ordered return to the zoo. 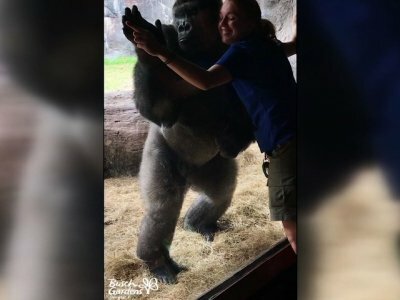 CINCINNATI (AP) — A judge has ordered the Cincinnati Zoo and a conservatory to resolve a custody dispute over a gorilla loaned as a companion to the late Koko, who was famous for mastering sign language. CINCINNATI (AP) — Attorneys for an Ohio zoo suing a conservatory for the return of a gorilla are asking a judge to rule in the zoo's favor without going to trial. The Cincinnati Zoo sued The Gorilla Foundation in October for the return of the silverback gorilla who served as a companion to Koko, the late ape famed for mastering sign language. The 37-year-old Ndume was loaned to the California-based foundation in 1991 under a contract that was revised to guarantee his transfer after Koko's death. 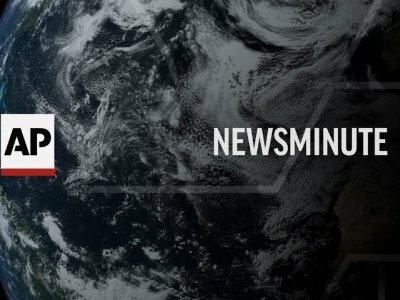 DAKAR, Senegal (AP) — A wildlife park in eastern Congo that is home to critically endangered mountain gorillas says a park ranger has been killed after an attack by armed militia at a ranger post on Lake Edward. Virunga National Park said the situation has been stabilized and an investigation into Wednesday morning's attack has been opened. It said Kasereka Masumbuko Ezechiel has worked at the park since 2012, expressing gratitude for his service and sending condolences to his family. CINCINNATI (AP) — The Cincinnati Zoo is suing for the return of a gorilla loaned to a California conservatory as a companion for Koko, the late gorilla famed for mastering sign language. JACKSONVILLE, Fla. (AP) — A critically endangered western lowland gorilla at a Florida zoo has given birth. JACKSONVILLE, Fla. (AP) — Suddenly, the bonobos were shrieking. Maybe the small chimpanzees were welcoming the small crowd gathering for the opening of their new African Forest digs at the Jacksonville Zoo and Gardens. Or maybe they were commenting on its centerpiece, the 50-foot, replica Kapok tree on which they were literally hanging out. "The excitement is building," said a voice in the crowd. CINCINNATI (AP) — A silverback gorilla that was born at the Cincinnati Zoo is headed back to that zoo following the death of the famed gorilla Koko. LOS ANGELES (AP) — A female western lowland gorilla is making her debut at the Los Angeles Zoo. The 24-year-old gorilla named Ndjia (in-jee-uh) was presented in her new habitat Thursday. She was brought from the San Diego Zoo on May 9 to be paired with the Los Angeles Zoo's male silverback gorilla, Kelly, under a program that breeds western lowland gorillas, a species considered critically endangered in the wild. 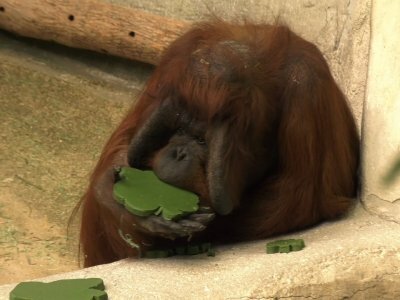 MILWAUKEE (AP) — The Milwaukee County Zoo says the deaths of two lowland gorillas have been linked to gastrointestinal infections likely caused by E.coli in their water supply. 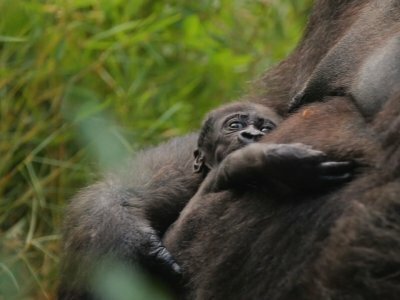 The zoo Thursday released results of necropsies of the 31-year-old male gorilla Cassius who died April 12 and 17-year-old female Naku, who died April 28. KAMPALA, Uganda (AP) — A new survey shows Africa's critically endangered mountain gorillas have exceeded 1,000 after conservation efforts, making them the only great ape in the world considered to be growing in number. The WWF says mountain gorilla numbers have increased to 604 from an estimated 480 in 2010 in the Virunga Massif, a hilly area encompassing parts of Rwanda, Uganda and Congo. PITTSBURGH (AP) — Visitors at a Pittsburgh zoo got a surprise when they witnessed a gorilla giving birth in the exhibit area. 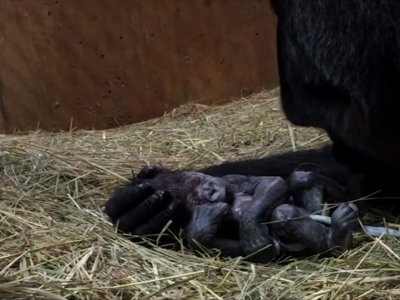 Moka, the Pittsburgh Zoo & PPG Aquarium's 22-year-old Western lowland gorilla, gave birth to her third baby Friday morning. The zoo says Moka is very attentive and has been encouraging her baby to nurse. MILWAUKEE (AP) — Officials at Milwaukee County Zoo are trying to determine whether the recent deaths of two of the zoo's gorillas are related. KAMPALA, Uganda (AP) — Uganda has begun counting its population of critically endangered mountain gorillas amid confidence their numbers are steadily rising, boosting prospects for its tourism industry that relies heavily on the primates. The last census in 2011 showed the East African country had 480 mountain gorillas in two protected areas, or about half of the world's surviving population. The others are in neighboring Rwanda and Congo's forested mountain areas. 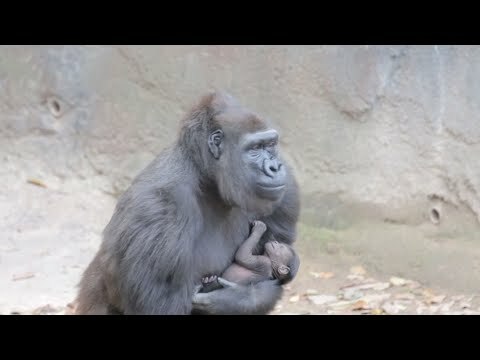 WASHINGTON (AP) — A western lowland gorilla was born at the Smithsonian's National Zoo and Conservation Biology Institute in Washington, D.C.
News outlets report Moke (Mo-KEY) was born Sunday. Zoo officials say his name means "little one" or "junior" in Lingala, which is a Bantu language. Moke's parents, Calaya and Baraka, were bred following a recommendation from the Association of Zoos and Aquariums' Species Survival Plan. MILWAUKEE (AP) — A male gorilla has died at the Milwaukee County Zoo after experiencing some health problems. Zoo officials say 31-year-old Cassius died sometime Thursday night. His exact cause of death is unknown. But in recent days he had not been interested in food or water. An exam found his heart might not have been fully contracting, and he experienced decreased liver and kidney function. Full exam results will be available in coming weeks. 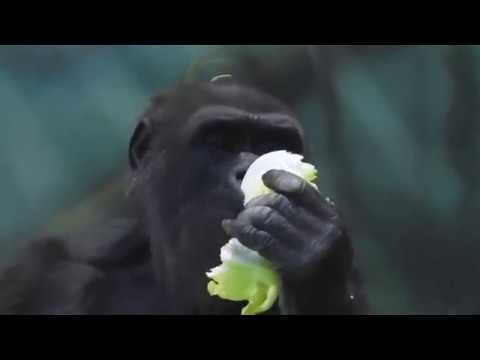 BERLIN (AP) — Fatou the gorilla, believed to be one of the world's oldest, is celebrating her 61st birthday at Berlin's zoo — nearly six decades after she found her way to Germany from a French bar. The zoo says she shares the title of world's oldest female gorilla with Trudy, a gorilla at the zoo in Little Rock, Arkansas. BROOKFIELD, Ill. (AP) — A 50-year-old gorilla that was one of the oldest gorillas in a North American zoo has died. The Chicago Zoological Society says Ramar, a western lowland gorilla living at the Brookfield Zoo, was euthanized on Thursday after a series of chronic, age-related health problems. GREENSBORO, N.C. (AP) — The first gorilla to live at the North Carolina Zoo has been euthanized. Local news outlets report The Brookfield Zoo in Chicago said on its Twitter page that Ramar was euthanized on Thursday, calling it a difficult decision. According to the Chicago zoo, Ramar was suffering from degenerative arthritis in his knees, had heart disease and had recently stopped eating. In addition, an examination found a blockage in his bowels. CLEVELAND, Ohio -- Remember playing "Rampage" at the arcade back in the 1980s? The classic video game has been turned into a big-budget action movie starring Dwayne "The Rock" Johnson. Among the new releases, the film is expected to take the gorilla's share of the box office this weekend. 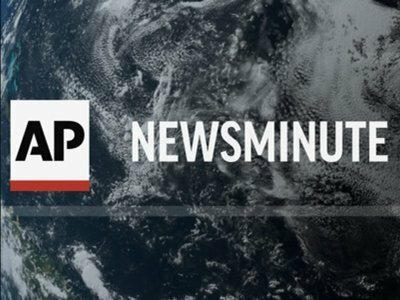 KINSHASA, Congo (AP) — Authorities in Congo say five park rangers and a driver have been killed in an attack at the Virunga National Park. The park, which is home to critically endangered mountain gorillas, confirmed the ambush Monday in a statement. It said a sixth ranger was wounded. SEATTLE (AP) — The 360-pound lead gorilla at Woodland Park Zoo in Seattle who became the adoptive father of a 2-year-old gorilla has died. Zoo officials say 40-year-old Leo died Thursday after a brief illness. The silverback gorilla, whose full name was Leonel, came to the zoo in 2008. His family group included 22-year-old female gorilla Nadiri, her 2-year-old daughter, Yola, and 16-year-old female Akenji. 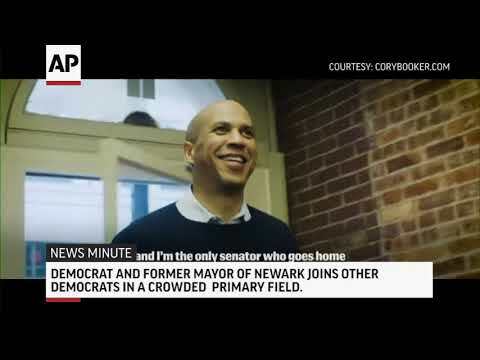 PHILADELPHIA (AP) — A male gorilla at the Philadelphia Zoo is taking a stand against dirty hands by opting to walk on two legs. Apparently, 18-year-old Louis is a clean freak. On a Friday morning in February, Ajari, a 17-year-old western lowland gorilla at the Houston Zoo, is being wheeled into an exam room at the on-site animal hospital. 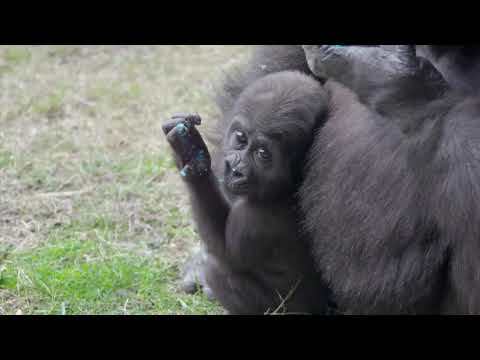 COLUMBIA, S.C. (AP) — A South Carolina zoo says a new baby gorilla is on its way. Riverbanks Zoo says a 12-year-old gorilla named Kazi has been pregnant for about four or five months. Her baby is due likely sometime in June. Veterinarians say the gorilla is in good health and there are no complications so far, but first-time gorilla mothers are more likely to suffer complications.